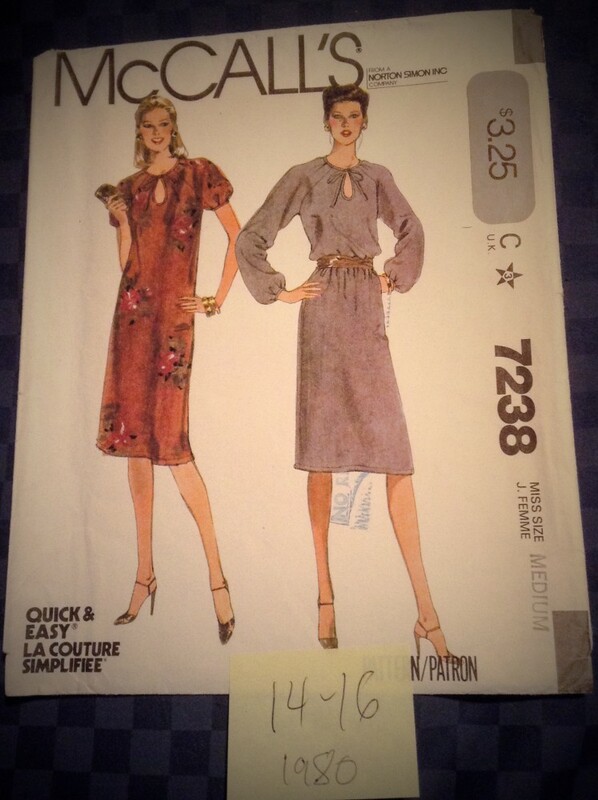 Vintage Sewing Pattern Pledge and MAGAM … – Nice dress! Thanks, I made it!! You’re gonna be one busy lady! I’ve voted for the simple dress as I think you need to make something you’re likely to get most wear out of – too practical?? Isn’t there a saying about “idle hands”? I can’t stop sewing, so I might as well have some direction, I guess? 😝 that’s a good idea – choice of dress – I spend most my time at work or home, so something practical is a good choice. We shall see what the vote says next week! Fingers crossed! And Thank you! Lucky you to be given lots of patterns to choose from! Yes, I have very thoughtful sisters! I am lucky! I’d definitely have a crack at the last three, the 80spatterns can be voluminous. I used one in a PR pattern stash contest and took eight inches out of the bust. Oh! Thank you for the tip! I will be sure to use my bodice sloper! Anyone have any more tips! I’m with Thimberlina on the classical dress. A good honest wardrobe staple. 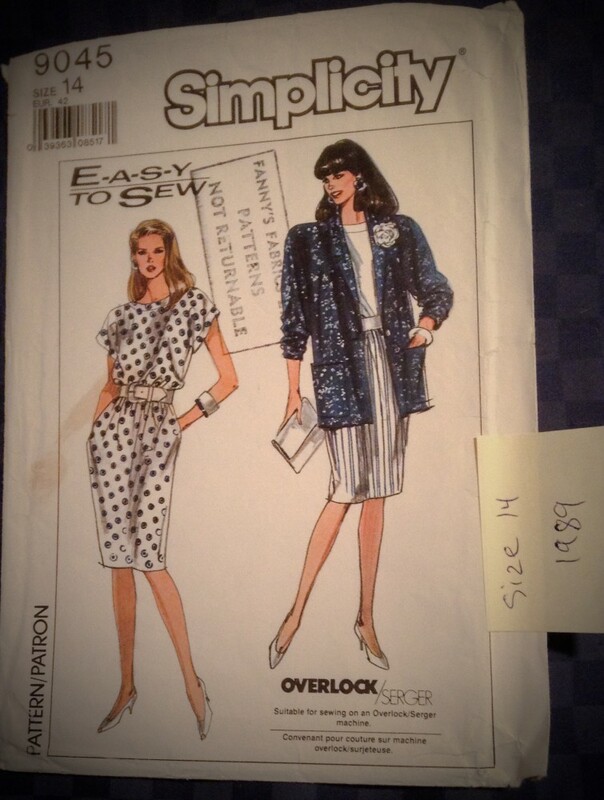 LOVE the coat pattern to the point of pattern envy….. I would make the jacket first purely for trip down memory lane value. Had one very similar in a bright burnt orange in the early 80’s and wore the thing to its grave. Oh, decisions, decisions 🙂 Glad to see I’m in tune with everyone else here. Think you’re right in a nice fabric, this would be perfect. Thank you! We shall see if the majority votes for it! Thank you! I like full skirts better than pencil skirts. Ooh! You just couldn’t keep me out of an attic! Sounds like a fun treasure hunt! 7238 in a lovely print would be my choice. Great set of patterns though – I look forward to seeing which one wins the vote! Thanks! I hope you voted! Well, I just had to vote. As you know, I have had all of these in my closet and the one that, so far, has gotten the most votes is the one I got married in (at city hall). Now, the one I found to be the most casual and comfortable one was 9045. I made that dress, as a summer dress, and loved it. Never did make the jacket. 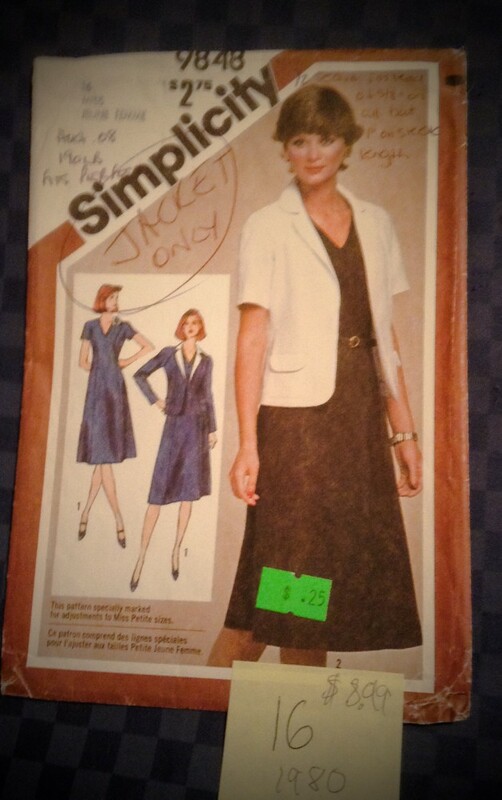 I am definitely with you, shoulder pads are vintage but a definite thing of the past. Good luck to you on all your projects. I remember that of course, but the dress… Was it a soft light blue? Because I seem to remember it being a soft light blue. Very pretty! Again, I say Thank you! for the boxes of patterns! Thanks for playing along! And thanks for the compliment! I voted! 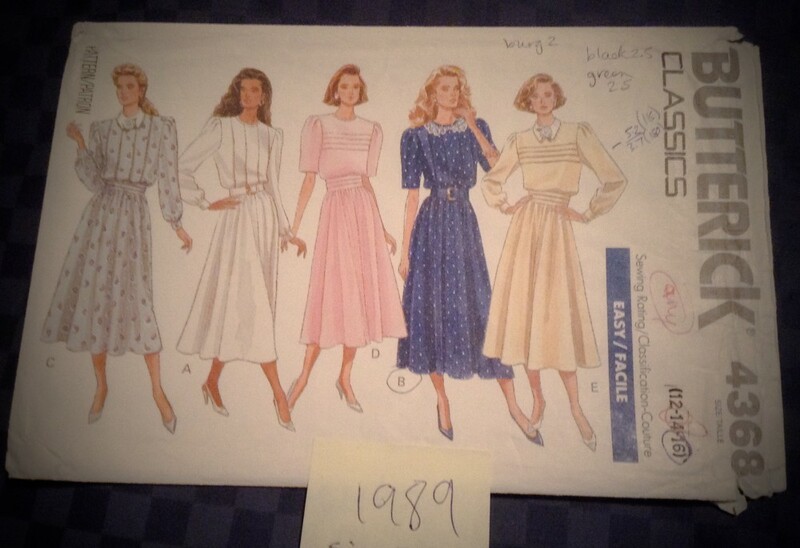 I remember wearing styles exactly like these lovely patterns – does that make me vintage too? It’s like going to a museum and personally recognising some of the exhibits! Well I remember these styles too – and those hairdos! – but I prefer something other than “vintage” as a handle… How about “classic”? Anything with “class” in it has got to be great! Oh my I have 3 large plastic containers with similar patterns! Where do you get your’s from, usually? On line shops? Or? Old friends, charity shops and believed or not I started sewing in the early 80! Haha, I have to say, and maybe it will make you feel younger, I started sewing with school courses, in the mid 70’s! Now silly me, and let this be a lesson to all, I threw out my patterns when I gained weight and when I lost it! Now I can at least try to adjust the pattern with some success and I don’t throw anything out anymore. Someone out there is probably valuing my long lost vintages! I must admit I rarely wear dresses anymore, but if I could lay my hands on some vintage clothes that might change. I love styles from the 1920s, 30s and 40s but that may be going back just a little too far, who knows. Mom always used to say whatever is old is new again. Going back too far is never too far. If I could ONLY find a thrift or second hand store or antique shop that had vintage sewing patterns or supplies, it would be true love! And of course, Mom was right! Hmm… Maybe I should loan it to you afterwards! Yes, I thought it would be on the edge of vintage being the 80’s but I looked it up and vintage is 25 years! Hard to believe! I absolutely love the first pattern – it has a bit of a late 40s vibe, which I love. The current front runner would have been my second choice, though. As you say, it’s a dress where the fabric is the star. I’m looking forward to seeing the finished result! We shall see which one wins first place… Maybe I will have room for the second place one too? 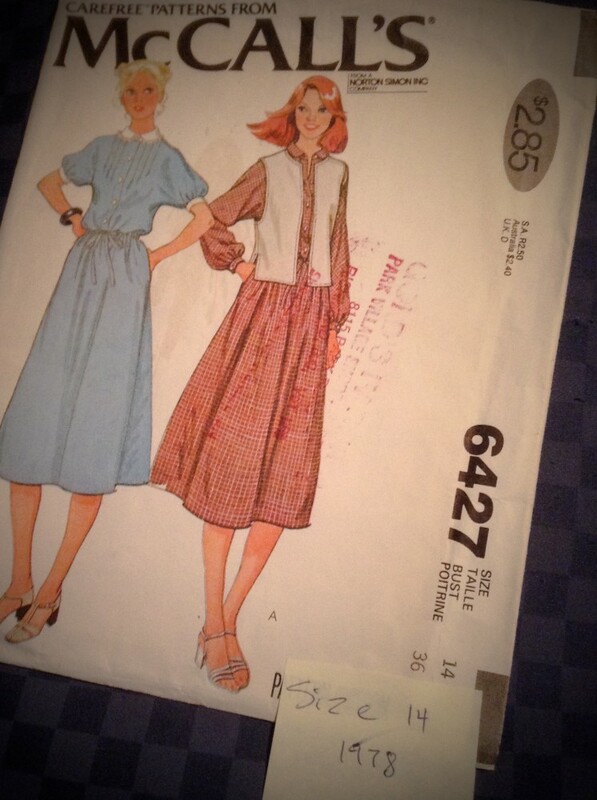 I was browsing Etsy tonight, the vintage sewing patterns are so lovely! This might be another addiction!